Although we had flown from Alice Springs to Ayres Rock we made the return journey by coach. 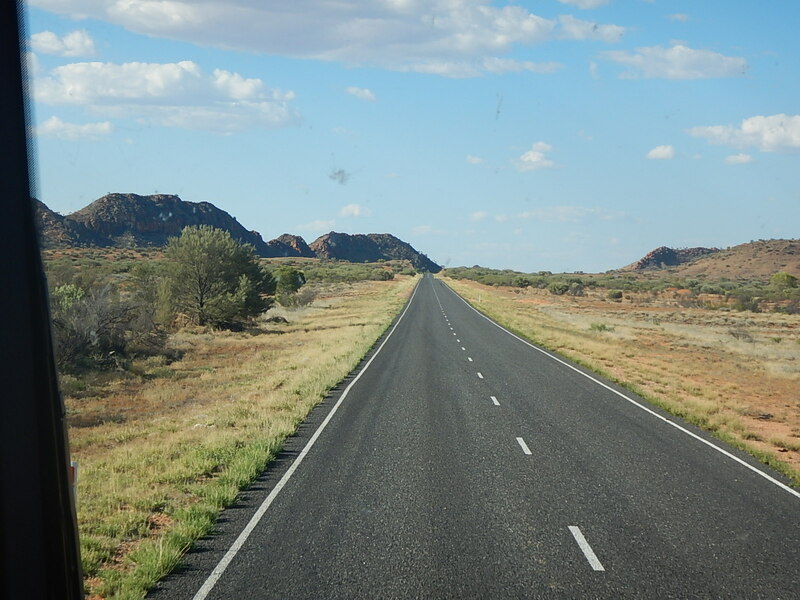 The trip from Ayres Rock direct to Alice is over 500km, and takes about 6 hours with a couple of stops, however our itinerary included a 500km detour for a night at the Kings Canyon Resort and a ‘scenic climb’ at the canyon. 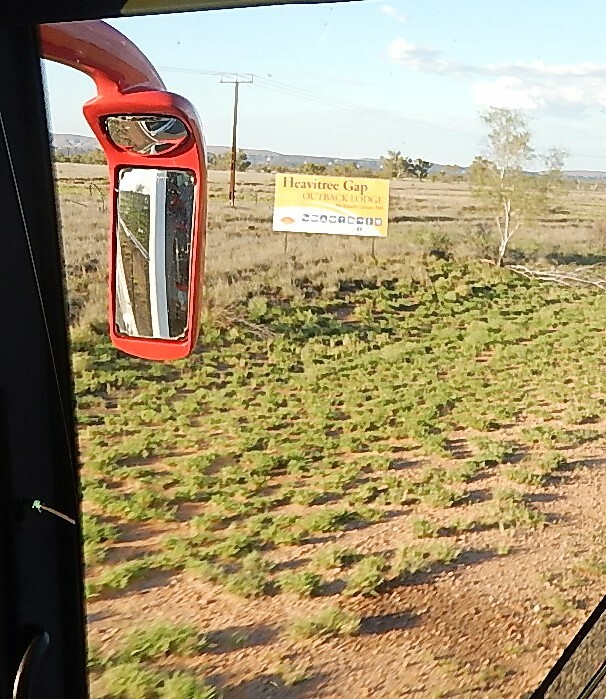 We caught the bus and drove for 2 hours along the Lassiter Highway stopping for coffee at Curtain Springs Station, a cattle station which has a simple service station offering food drink, fuel and toilets for people travelling through the outback. 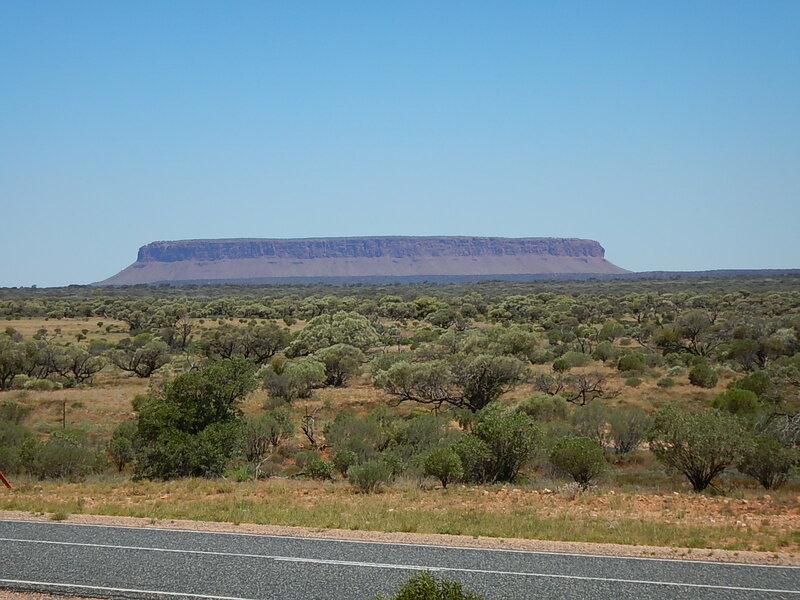 Along the way we got a view of Mount Connor, another huge rock rising out of the desert, equally as impressive as Uluru, it is very curious that everyone knows about Uluru but the other rock features never get a mention. At the junction with Luritja Road we rendezvoused with two other coaches for a passenger swap; people heading direct to Alice Springs joined another bus leaving just four of us on the 58-seater heading to Kings Canyon. We moved up to take the seats immediately behind the driver, Tony, who proceeded to entertain us with stories and information about the roads and local characters. One person he told us about was a guy called Len Beadell a surveyor and road builder appointed by the Australian Government to set up a series of rocket testing sites in the 50’s. Tony played a recording of an after-dinner speech Beadell Made in the 80’s, he had an amazing story to tell and a great sense of humour, the journey to Kings Canyon flew past. We hadn’t been given much information about the ‘scenic climb’, just a pick-up time of 06.15, a quick look at the Kings Canyon website gave us an idea what to expect. The Rim Walk begins with a challenging 500-step climb. But it’s worth every step. 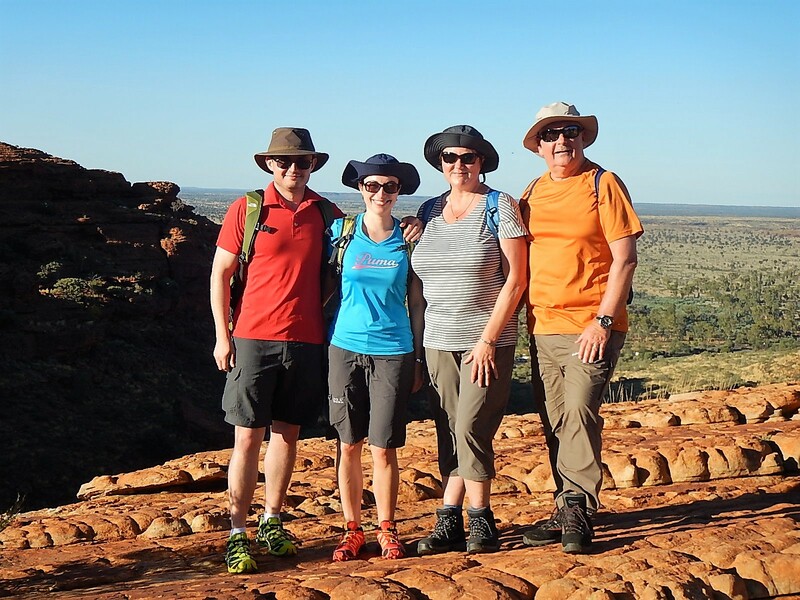 Upon reaching the summit, you will marvel at the breathtaking views of Watarrka National Park and into the canyon itself before descending into the green oasis of the “Garden of Eden.” At sunrise and sunset (the time most walks take place), the colours of the canyon are ever changing. The Rim Walk is a strenuous walk, meaning people who are in good health, lead an active life, play sports or walk on a regular basis will be more than able to complete the walk in around 3.5 hours. Alternatively, you may wish to explore the canyon floor, an easier shady walk that follows a trail between the two sheer walls of the canyon. We were leaning towards doing the Canyon Floor walk but Tony encouraged us to tackle the rim walk insisting we could take our time and pointing out that we probably wouldn’t be back to do it on another occasion. To help persuade us he drove into the Watarrka National Park on the way to the hotel to show us the start of the climb; when he first pointed out the path it just looked like a loose rock fall on a cliff side, closer inspection revealed a flight of steps going straight up from the canyon floor to the rim! Tony explained that once you have climbed the steps you have to complete the rest of the walk because the steps are so steep people aren’t allowed to come down them. Our fellow travellers, a young German couple, were keen to do the walk and, even though the forecast for the next day was 41⁰C, throwing caution to the wind Mark and I decided to give it a go. We all agreed to meet Tony and our park guide at 05.45 the next day – the start time was moved forward so we could get as much of the walk done as possible before the temperature rose too high. 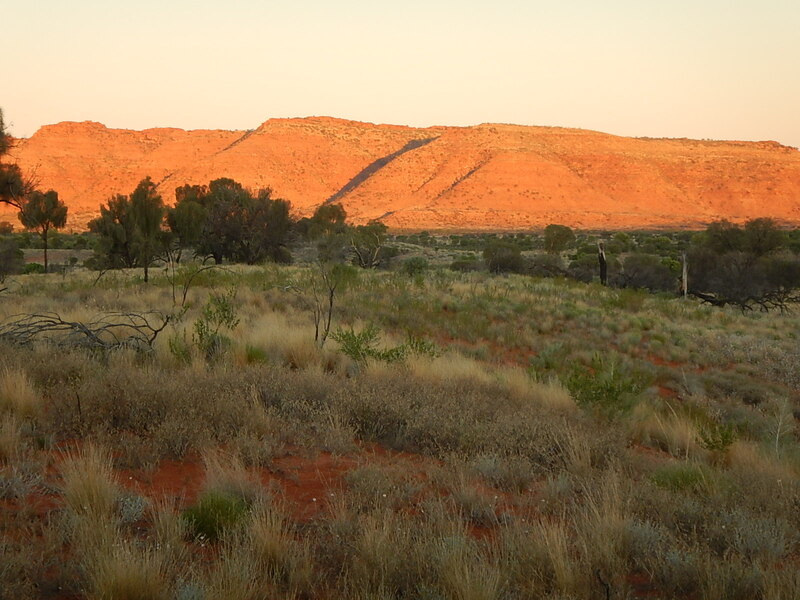 We checked into the Kings Canyon Resort, a hotel with about 40 rooms in cabins looking out over the open desert. We were in a Deluxe Spa room which had a huge spa bath set in a bay window in the bedroom. After walking down to the sunset viewing platform to watch sunset over the rock escarpment and dinner in the very smart modern restaurant we took advantage of the bath and watched the night sky through the picture window. We got a short but good night’s sleep, had breakfast at 05.15 and boarded the bus. Check out time at the resort was midday which meant we had a couple of hours to recover in the air-conditioned room and were able to shower and change before we re-boarded the coach and set off for Alice Springs. In between Kings Canyon and the Laritja junction we stopped at Kings Creek Station for a traditional outback lunch of camel burger and milkshake (well, maybe not very traditional, but good), we picked up some other Alice bound passengers at the junction and stopped again at Erldunda for ‘afternoon tea’. We eventually reached Alice at about 18.30 and were pleased to get off the coach to check into the Doubletree hotel, part of the Hilton group. Our relief didn’t last long, checking the overhead luggage rack we realised we had left a rucksack at Erldunda, it contained Marks dirty laundry and both our wallets. We don’t normally keep both wallets in the same place but we had changed our established packing routine to make room for several bottles of water we needed for our journey through the outback. 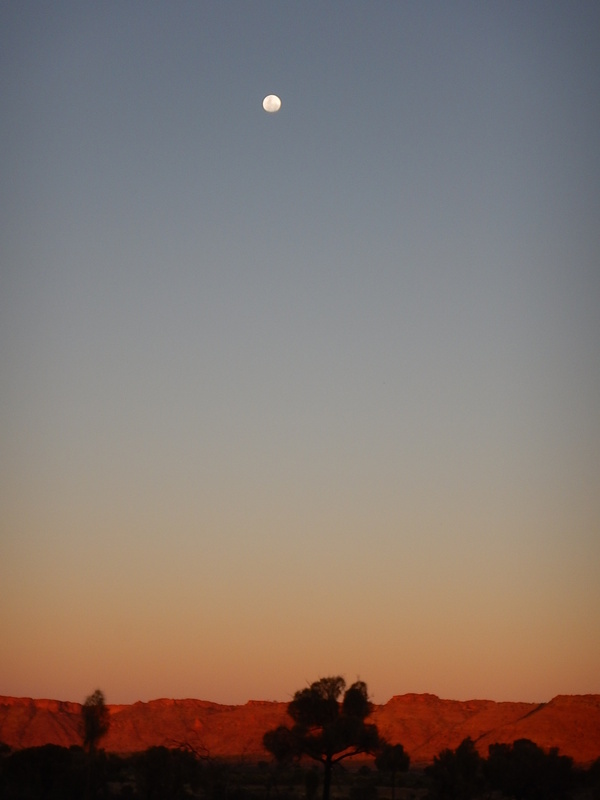 The hotel receptionist called the Eldundra Station, they had already found the bag and arranged to put it on the Uluru to Alice bus the next day, in due course it arrived at the Doubletree with all the contents present and correct. Lesson learned, don’t change a successful routine.